Have you ever heard of the fictional comic character Deadpool that used to appear in comic books from Marvel? Now this guy, who used to be an anti-hero, comes as the main character of this PC game Deadpool. Deadpool was first released on June 25, 2013 and is an action packed game along with violence, mature contents and strong languages. 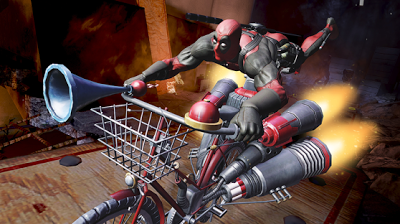 Deadpool has been developed by High Moon Studios and published by Activision. This 3rd person action game has been launched in all the major gaming platforms including Windows PC, Xbox 360 and PlayStation 3. This hack and slash video game written by Daniel Way based on the Marvel Comics runs on Unreal Engine 3. You may remember the image of old Deadpool, the character from Marvel Comics. For those who are not familiar with it, let me tell you a little about the Deapool's appearance. Deadpool is an immortal superhero with a disfigured body that shows scars that he is burned with. Even though these scars do not lead him to physical imperfections, he always used to wear a close-fitting suit covering his whole body along with a mask without even leaving small hole for the mouth and nose. That is all with the introduction of the character Deadpool. Coming on to the game, Deadpool is really a funny game containing sexual jokes that the character cracks. High Moon Studios has made a nice move by making a game about a comic character by throwing out an excellent script. This game has successfully brought the old anti-hero into an impressive interactive 3D. Various stuffs added within this game makes it more enjoyable and interesting. While talking about the gameplay of Deadpool, it is filled with impressive action which is much predictable and delivers thrilling experience. One of the most interesting thing in this game is none other than the excellent weapon system that gives the players access to the most deadly weapons. There is even an upgrade system available for each weapons that you purchase. While this game even offers you the most thrilling levels in variety of forms including jungle level, office level, sewer level and so on. On the other hand the thing that may feel unimpressive is the bad guys, not because they are ugly or anything, it is that they all look similar. Another annoying thing in this game is the boss battles which are comparatively much boring and also is repetitive, but it does not mean they are too easy. As you go through the game, there is one thing that you will notice for sure, it is nothing other than the repetitive gameplay. Even though it may sounds little bit boring, you will definitely enjoy it as the game even features melee attacks along with various other combos including shooting combat. Although these attacking combos are long enough to kick off most of the enemies, these attacks are not sufficient enough to blast off tougher enemies. This problem mainly arises due to the lack of variety in attack combos. Yet another thing to keep in mind while playing Deadpool is about the DP points. These points can be earned easily by throwing out the combo chain. For more such points your combo chain must be higher. Deadpool even allows you to purchase various weapons with the use of those DP points that you have earned. The weapon system that can be purchased even includes grenades, shotguns, bear traps, sledge hammers etc. You can either purchase a new weapon that you don't own or can also go for upgrading your current weapon to make it even more powerful. As mentioned earlier, Deadpool is filled with action combo, is a good game that adds some crazy humor along with a creative script from a great writer. According to what you actually expect from the game, it may seem either good or bad. If you are don't mind some insane adult jokes and repetitive gameplay, then you will definitely love this game. But as always there are some cons too. There are issues with controls and camera that you may face in combat. And at times it may make you real mad when you see your enemies coming towards your flooding the whole screen. Apart from these Deadpool game is quite entertaining as well as enjoyable.